I've just moved into a new house and for the first time since I moved out of my mum and dad's place in 1991 I have the use of a garage. Well, actually, since mum and dad both had a car, this is the first time I've ever had the use of a garage. My previous house, which I'd lived in for ten years, had a garage but it never saw a car. My bike lived in it as did the boiler, a workbench, a mass of shelves and a wardrobe. But not this time. When I first viewed the property I scooted through the house and mentally ticked every room as being suitable. Then I walked into the garage and paused. The house was fine, just right, but the garage was perfect. It's one and a half car lengths long and slightly wider than usual. At the end are a bunch of workbenches and old kitchen cupboards. I can fit my Audi TT and Triumph Street Triple in it and there's still room to stand at the workbench and work on...stuff. It get's better. The garage has it's own pitched roof and loft area. The loft is lit and fully carpeted. It is, perhaps, the perfect garage. When I moved in the previous owner had left a load of junk in it - not least some massive steel shelves. The fridge freezer in the house wasn't working either so I bought a new one and the old one was moved into the garage. For the first few weeks my TT lived outside as I slowly cleared all the detritus out but, only last weekend, the garage was finally free. It was empty and open. It could accommodate the car. Actually the TT wasn't the first car to live in the garage. My friend's Peugeot needed a touch of paint before it was sold so that spent all day Saturday in the garage - good job too as it rained - getting some Aegean Blue applied to it. Then, on Sunday, the garage was all mine. It felt so good to finally drive into the garage, shut the door, walk out of the side door and into the house. I turned back around and had another look and experienced a frisson of pleasure. Everything fitted perfectly, even the ladder leading up to the loft. But two things needed sorting. How to stop the TT's door banging on the wall and how to know when the back of the car was just in the garage? Too far in and I'd knock the bike over, not enough and the door won't shut. The problem was solved by the application of some old carpet on the garage wall, and a line drawn on the carpet. Line the door edge up with the line and the car is just far enough in the garage. For a bloke who's into cars and bikes, and tinkering with aforesaid, as well as a spot of DIY, my garage is perfection. And now thoughts turn to what else I could fit in the garage. The drive is big enough for three cars. The TT could live outside, it has done all it's life so far. I could buy a project car although thus far I've yet to decide on a budget or even a car. A Porsche 944 in need of some attention would be ideal but that'd probably be out of my not yet decreed budget. Maybe an MX5 or something similar could be fun. Or I could even get a project bike. Whatever, for now I'm enjoying just having a garage. Just having one is a luxury. It's well lit so I can work on the car and bike in the evening and spacious enough to still get around and find and use my tools. I'm praying for snow this winter so I can be one of those smug commuters with a warm, clean car - for the first time in my life. 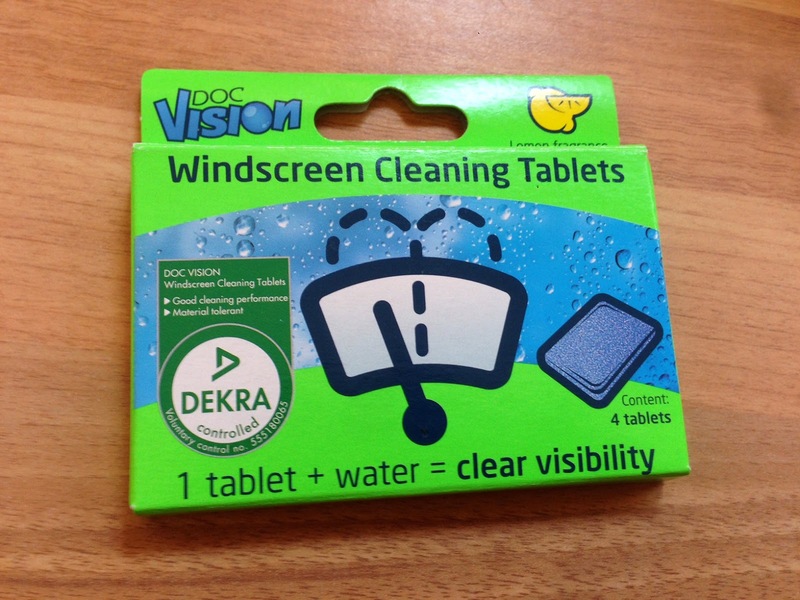 Also, a company called DocVision got in touch and said they'd just been made the sole importer for a new product - a screen wash in tablet form - and would I write something about it if they sent a sample? I said yes and said box of tablets turned up in the post. Now, I don't normally use screen wash as it's so bloody expensive. DocVision's tablets cost £5.99 for a pack of four. You just pop one in the screen wash bottle and they work well. The windscreen is smear free and it smells faintly of lemons when I use the wash wipe. The tablets are meant to work at down to -3°C and are 100% biodegradable. So far I'm happy to recommend DocVision - and, no, I wasn't paid, I just got the sample.